This event "nhow Music Night: Lary + delta. 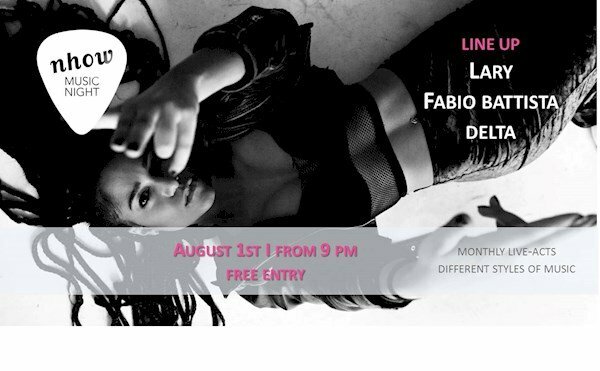 + Fabio Battista + Free Entry + Monthly Live-Acts + Different Styles of Music" @ nhow Hotel has already ended on 08/01/2015. Am 1.08.15 lädt das nhow Berlin wieder zur monatlichen nhow Music Night ein. Regelmäßig werden hier Newcomer und bekannte Namen verschiedener Genres vereint, um ein Mal im Monat das nhow Berlin zum musikalischen Hot Spot werden zu lassen. Der Eintritt ist und bleibt frei. LARY und reitet mit der Chimperator-Künstlerin auf der "Future Deutschen Welle"! The nhow Music Night is a platform for musicians and bands to promote their music in an exclusive location. Starting in 2011 as a small Jam-Session "The nhow Music Night" has developed to a steady music event in Berlin. However the main purpose hasn't change ever since. We have created a space where people can meet to share the passion for the one big love that connects all of us: the music. If you're a musician, please find below the requirements (they are very little). * please apply with a demo or a live video at d.trampf@nhow-hotels.com!